Why I chose this photo: There’s truth in the masked man or woman… War forces the ones affected to wear a mask, hiding what makes them vulnerable–fearful of what they may take from them next. Well depicted here with strong emote. Loved this photo! Why I chose this photo: For this photo manipulation I give it 5 out of 5 stars for it’s surreal depiction of the never changing effects of war. Why I chose this photo: He claims he only had two hours to sketch this but, man oh man does emotion seep out. If this is a rough draft, I’d love to see what he can do with this after a few revisions! Seriously though, it’s raw and thus perfect. I see the disaster and pain of a war torn city. Why I chose this photo: The artist (a drawing of a celebrity’s tattoo) depicts with his image what all authors feel when told to confine their work to a specific standard. Yes, it’s like a ball and chain while you’re attempting to create. I have got a gold medal-first prize for this picture at Photo of the youth 2003 in Slovenia. i took this one last year when Iraq was very popular or how to say…. but i think that this photo is quite good also for these days. just remember Madrid and wars all over the world. Ciril Jazbec (1987) was born in Slovenia, which is where he first took up photography and visual storytelling. His desire to expand his horizons led him to London where he studied MA Photojournalism and Documentary Photography at the London College of Communication. He is drawn towards stories that reach out and touch you, making you stop, think and take action in the midst of our ever-changing world. Moved by the story of the disappearing islands of Kiribati, Ciril had endeavored to capture the essence of the place whilst that remains possible. Through encounters with the locals, activists and the President, Ciril addresses environmental issues and offers a testament to the spirit of the people. Ciril is currently based in London, UK. Why I Chose this Photo: His face says it all. A reality crushed, a new existence… No wonder this artist received an honorable mention with Daily Deviation Spot. hey, peeps! check out my latest piece on CGChannel — “a moment of rage”. Why I Chose This Photo: Okay, maybe it’s just a chipped chess piece lying on it’s side… It’s not, it’s so much more than that. Don’t you feel the emotion portrayed here? It tells a story. A seriously well captured shot. 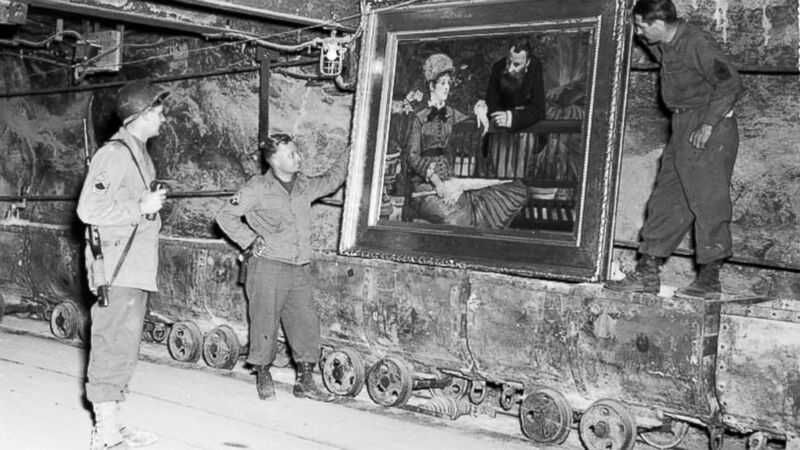 In this April 25, 1945 image released by the U.S. National Archives, U.S. Army personnel stand by a painting called, “Wintergarden,” by French impressionist Edouard Manet, which was discovered in the vault in Merkers, Germany. The story of a special Allied unit dubbed the “Monuments Men” has inspired a Hollywood film set to premier early next year. But who were these men who saved countless European cultural treasures from being lost or destroyed by Nazi forces? It was May 17, 1945, not long after Nazi forces had surrendered, ending Word War II in Europe, when miners dug through the wall of rubble with picks and shovels in Altaussee, Austria. There was a 12-meter thick layer of debris blocking the entrance to the salt mine, and though no one knew what was inside, they all hoped they would find what they were looking for. Corporal Lincoln Kirstein was the first to crawl through the opening. Inside, it was dark and eerily quiet. The entrance was covered in dust and debris, and an iron security door hung shattered on its hinges. Deep inside the earth, Kirstein finally found what he had sought for so long: Europe’s cultural legacy. The wooden crates were coated with a thick layer of dust, but otherwise undamaged. In the years prior, Kirstein had been a writer and critic in New York, working on a number of projects that included launching a ballet ensemble in Dec. 1941. But when Pearl Harbor was bombed, the intellectual put his plans on hold and joined the military. He didn’t end up battling with weapons, though. The 36-year-old intellectual has a special task in Europe. As one of the “Monuments Men,” he was tasked with preventing the destruction of Europe’s cultural treasures. The Allied commanders created a “Monuments, Fine Arts and Archives” section after the 1,200-year-old Monte Cassino Abbey was destroyed by a hail of allied bombs in February 1944. Their orders were to protect churches, antique ruins and cultural monuments — a meritorious task that would lend a moral dimension to a military victory. But the mission was muddled by chaos. Kirstein arrived on European soil in June 1944, hungry to take part in an effective, clearly defined mission. What he found, however, was that no one had heard of his unit, and no provisions had been made for vehicles, typewriters, radios, maps or even enough paper and pens. It was only by his own initiative, and with the help of his personal contacts, that Kirstein managed to get to France, where he met Lieutenant James J. Rorimer. The medieval expert and curator of the Metropolitan Museum of Art had been on a personal mission against German dictator Adolf Hitler since Michelangelo’s Madonna in Bruges and the Ghent altarpiece disappeared. When he got the chance to go to Europe with the Monuments Men, he took it. The art historian was fending for himself in France without any military authority. With only a list of monuments worthy of protection and an order from Supreme Allied Commander Dwight D. Eisenhower, he travelled through northern France trying to save what was left to save. The key was improvisation. Rorimer consulted with officers and hung signs forbidding entry on church and museum doors. He also fastened signs onto important buildings with white tape, marking them as mine zones to keep soldiers away.